A U.S.-backed moderate-opposition group in Syria said it shot down warplane belonging to the Assad regime Tuesday and captured its pilot alive near a ceasefire zone in the war-torn country's south. 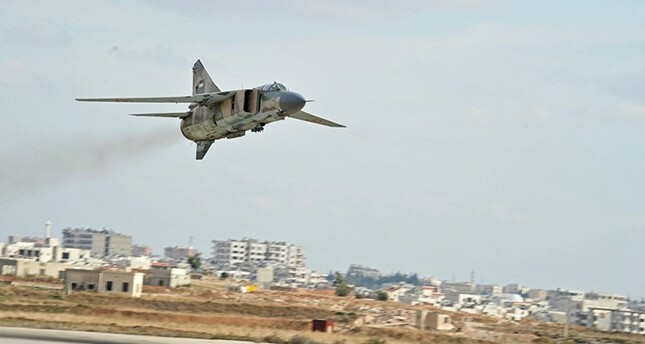 The Ahmad al-Abdo Forces shot down the MiG-21 near Wadi Mahmud in the southern province of Sweida, the group's communications head Fares al-Munjed told AFP. The Anadolu Agency identified the opposition group as Jaish Osoud al-Sharqiya and said that the little-known group claimed the jet crashed in the Wadi Mahmud region near the Jordanian border. "The pilot is in our hands. He is injured and being treated," Munjed said. The Syrian Observatory for Human Rights, a British-based monitor, confirmed the opposition faction had shot down the plane and captured its wounded pilot. According to Munjed, the area where the aircraft was downed is outside a ceasefire zone negotiated last month by the United States, Russia and Jordan. Parts of Daraa, Quneitra, and Sweida provinces are included in the agreement, which has brought relative quiet to the zone though some violence has been reported. Days after the deal went into effect, the Ahmad al-Abdo Forces hit an Assad regime jet but it landed safely in regime-controlled territory. Munjed said his group had used a "23 millimeter anti-aircraft gun" to down the warplane Tuesday. "We will take care to treat the captured pilot in accordance with international law," he told AFP. The opposition group's leadership was still debating what would happen to the pilot after his treatment, he said. More than 330,000 people have been killed in Syria since the conflict began in March 2011 with anti-government protests. Multiple attempted ceasefires, including nationwide truces, have failed to bring a long-term end to the war. The Assad regime is accused of frequently violating the ceasefire agreement brokered by Russia and the U.S., as well as targeting hospitals, schools and other areas, resulting in countless civilian casualties.